Coppice è un duo di Chicago, formatosi nel 2009, composto da Noé Cuéllar e Joseph Kramer che vi abbiamo presentato nel 2013 con Big Wad Excisions e che metteva in evidenza un approccio “avant” alle strutture rumoristiche. Cores/Eruct è il nuovo album che uscirà nel 2015. Abbiamo fatto una breve chiacchierata con il duo per approfondire alcuni aspetti della loro arte. 1) This Year will be out the new album “Cores/Eruct”. What can you tell me about it? What is the idea behind it? We describe it as music about what is kept in, a journey into and out of something to reach its “something.” It’s an album that is concerned with precision, rigid structures, zooming into its gooey, colorful insides and back out. 2) What will be the difference or the peculiarity of this new album compared to your last works? Compositionally it’s a follow-up to Holes/Tract. Cores/Eruct is both narrative and fractal, a window and windows for insight and insights. It includes the full version of While Like Teem or Bloom Comes (Tipping), which may be familiar to those who’ve heardCompound Form. 3) I’m curious about the composition process of your music and about dynamics between you two. How does it work? We think what makes it work is our shared desires for specific effects in musical and listening experiences. But what we think isn’t always right so there are other forces at work that our thought processes can’t quite process! 4) Your music had often been part of art installation. What about this aspect of your career? 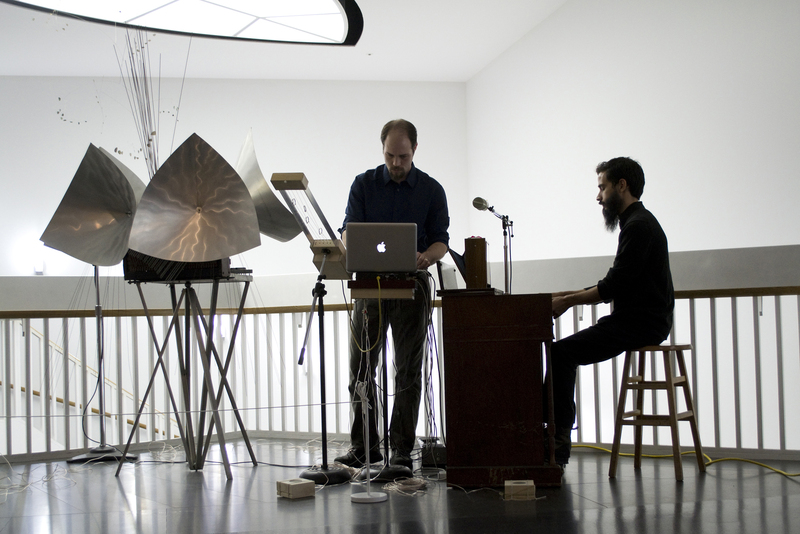 Installations combine interrelated interests in objects, audio, and music. They mostly relate to the archival sound/sound research branch of our work, as a way to place the listener in close physical proximity to audio and materials. Materials like aluminum, steel, copper, brass, glass, wood, fabric, and twine reoccur in our instrumentation, technology, and visual imagery. But then, installations have also been integral for some music performances. The edges between all these categories blend very quickly in the process of making. 5) Experimentation is also a peculiarity of your music. What is your definition of the concept of experimentation in music and art? We’re experimental in the rigorous scientific sense rather than in our perception of people’s expectation of the “experimental” genre. When we compose we try many things but not just to see what happens. It’s more like tending private objectives. The incidental is a very important constant in our music, and its behaviors are vital within our structures. We understand we may be “experimental” for listeners in the sense of being uncommon or challenging, but we don’t strive for separation (especially this day in age.) Our goal is to create fecund listening experiences for the engaged lover of the music experience. 6) What about live shows? How did you conceive them? The live shows always stem from repertoire. Stage performance and installation-based performance are two modes we’ve alternated between in the last few years, and each is conceived based on contextual variables. The point in common between those two modes is the hope to spark the listener by affecting their focus and dispersion of attention. They’re all so different!